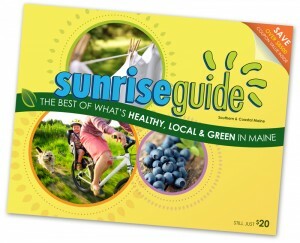 Look for us in the new 2012 edition of the SunriseGuide, Maine’s resource guide what’s healthy, local and green. Look for us in the new 2012 edition of the SunriseGuide, Maine’s resource guide and coupon book for the best of what’s healthy, local and green. Produced and published right here in Maine, the SunriseGuide covers a region that stretches from greater Portland to Belfast. It features a collection of articles, tips and ideas to inspire, educate and inform you, plus 300 valuable discounts.